I'm a fan of doing things myself. Part genuine curiosity, part plain arrogance than I can do it more to my liking than a stranger can, part cheapness. So the concept of making decisions about finishes and moldings and fixtures seemed super fun when were first starting laying plans for this house. In reality its not all its cracked up to be. Don't get me wrong...its still 50% fun, and that ain't bad considering most things in life are about 0-2%. But there is that other 50% that is a mix of uncertainty (will I be happy with this choice in 5, 10, 20 years? ), outrage (how can they charge so freaking much for a rectangular piece of ceramic??) 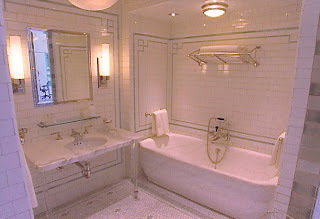 and creative block (I know exactly what I want the bathroom to look like - if only I could describe it). Unfortunately for me, this bad girl bathroom is a reproduction of Helen Rubinstein's art deco bathroom by a company that also sells this salvaged lamp for close to $10K. So you do the math - its way out of my reach. Short of that, Id love to tile the bathrooms with the reproduction subway tiles that are squared off to allow for really tiny grout lines. ( see for yourself at http://www.subwayceramics.com/ ). Only a few companies make them from what I can find and for that extra work of squaring the sides, they charge 10x as much... and that's just for the plain rectangular ones. Any of the trim is even more. Or I can go with the $2/sq foot option that has a bit of an eased edge and is thinner. (this is probably the cheapest option: daltile). So you're probably asking yourself - whats the big difference? I know, I know. Its a small difference from these photos. But take my word for it, for someone who is obsessed with these small details, the difference is glaring. I'm sure when its all said and done, I'll be making some major compromises on the plans I have in my mind's eye. But I'm not quite ready to give them up just yet. So indulge me a little while. That's my way of saying I'll occasionally post ideas that I already know are unlikely to see the light of day but I hope you like the pretty pictures anyway. Next up: Peel Away's handiwork on the top floor bannister.